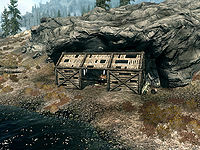 Riverside Shack is a small shack east of Gallows Rock and west-southwest of Kynesgrove, along the eastern bank of the White River. It is a derelict house, with holes in the roof and walls, and no front door or windows. It is home to a leveled animal. There is a small vegetable garden to the right of the shack containing six leeks and a hoe. Heading downstream from the shack are a couple of Creep Cluster plants and several Dragon's Tongue flowers. When first discovered, it becomes very clear what happened to the inhabitants, as a leveled hostile animal will jump out and attack you. Subsequent visits will normally find the animal outside the shack. It is more a sort of lean-to, having only a front and side walls, and a roof built up against a rock face that is used as the rear wall. Half of the front wall is an opening with three salmon hanging from the eaves. At the rear, against the rock face is a campfire with a cooking spit with two metal pots hanging over it. These contain two pieces of mudcrab chitin and a portion of grilled leeks. By the fire is the gory remains of the owner, who at the time of the attack was apparently reading the book Pirate King of the Abecean, which you can find on the floor next to an overturned chair and a fine hat. To the right, also against the rock face, is a tanning rack. Against the southeast side wall is a tall wardrobe and a single unowned bed, with a pair of hide boots under the foot of the bed. At the other end of the shack, against the northeast side wall is an apprentice-locked chest which contains Treasure Map III (the map doesn't respawn when the chest does). There is a small set of shelves to the left holding some common clothes and boots. 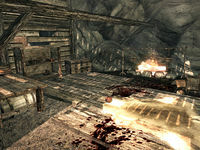 Finally against the northwest wall, by the opening is a long wooden table with an iron dagger, a copy of the Light Armor skill book Rislav The Righteous and four common books on top and a couple of food barrels and a medium coin purse underneath. This page was last modified on 28 October 2014, at 05:29.